(MATT) We awoke at 7:30 and cleaned up and, since we had no food, were off by 8 a.m. (correction, we each had one and a half granola bars and two triangles of Tobler.) We ate one of the granola bars immediately. So forgive me if my first sentence was not entirely accurate, but I will leave it as it stands because it sounds so good. Anyway, we set off for the "shark's fin" we had seen the previous day. A hand written sign said that it was a two hour hike and a trail marker said 2:45. So we figured we'd get there in a little under 2 Hours. Well, whoever did it in two hours must have run and never stopped running. He should be a tri-athlete. Don't mess with that guy. It took us 3 1/2 hours at a conservative pace. Our hike names are now Porsche for Jon because he's fast, small, and burns up fuel; Jaguar for Sam because of his well-rounded body and alot of muscle under the hood; Volvo for myself, not to fast but steady and dependable; and Chris was our leader, always out in front, the Pace Car. Well, the top was sunny and pretty. So after Jon and Sam came down from the base of the fin--I stayed behind again--we ate the rest of our food: 1/2 granola bar and a triangle of chocolate. 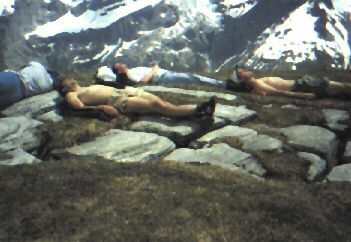 Then we all took a nap, jumping to our feet now and again at the distant sounds of avalanche, hoping to catch a glimpse. We never did, but were consoled by the magnificent view of the surrounding mountains all to ourselves for about two hours. Then we began our descent. We walked down and passed some people that had stayed in our hostel the previous night, including the couple I had stayed up talking to. After a brief hello, we pushed on. 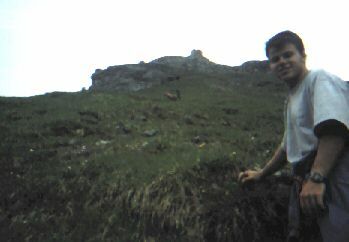 We saw some genuine mountain goats; we knew that they were genuine because of their ugly, matted hides and unkempt beards. And we enjoyed watching them scratch themselves in public (sort of) with their horns and we appreciated being in their territory. We came to a hotel, to our surprise and stopped to see if we could perhaps get a sandwich. The lady said sure and we didn't even to bother to ask how much. That's how hungry we were. (It was about 3 p.m.) We ordered ham and cheese sandwiches and sat and talked about food and what we would have if we could have anything. Then, the conversation turned a little more realistic--how big would the sandwiches be. Small, medium or HUGE. We were very satisfied with their size, texture, volume, and country simplicity. Most of all, after all that hiking, we were just glad to put something into our empty bellies. We finally made it back to our car around 4:30, 8 1/2 hours after beginning our hike. 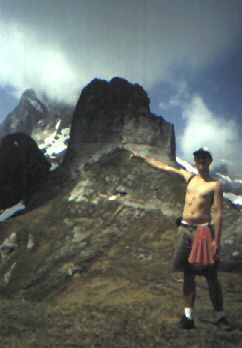 It was a truly great hike because it had not only beauty, but it made you really work to get it. We stopped at a grocery store, had a snack and saved our ravioli for that night. 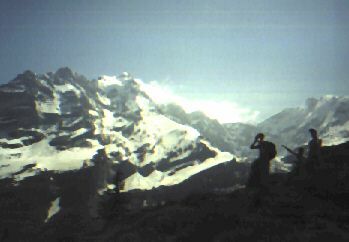 We were heading up the other side of the valley to Kleine Scheidegg, just below the Jungfraujoch. We hoped that the "dorm" we had heard about had cooking facilities and decided it was worth the risk. We went to the Lauterbrunnen train station, changed money, and bought tickets to Klein Scheidegg. The ticket lady was quite surprised we wanted to go there and we never did figure out why. (There are no roads for cars up the mountain to Jungfraujoch, only trains.) We enjoyed our first train ride (for $20) in Europe to the top. It was cloudy so we couldn't see too much. We walked up the hill to a hotel, after asking a local and trying to understand his French efforts to tell us where the "dormir" or dormitory was. We walked up and spoke with the Inn keeper. We eventually figured out that this was the place we were looking for and agreed to stay, but hold the breakfasts, for only $15 each. I took a chance and asked if we could use her kitchen to heat our ravioli and she said no. Jon, Sam, and I were thinking about eating it cold back in the room but she must have seen the starvation and disappointment in out tired, sunburnt faced, because she changed her mind. It must have been the mother in her wanting to care for us because she ended up heating our ravioli, set our table and even brought us wine glasses for the bottle we had brought. I asked to help but she politely refused and, to our thank you's simply smiled and said it's OK.
After eating all that beautiful ravioli, bread, and wine, we went back to the room. Chris and I showered in awesome showers while Sam and Jon fell asleep around 9 p.m. I wrote in the log for a little while while Chris said his rosary, then we switched and their I drifted off into an awesome sleep.